"By the sacred anointing of the sick and the prayer of the priests the whole Church commends those who are ill to the suffering and glorified Lord, that he may raise them up and save them, and indeed she exhorts them to contribute to the good of the People of God by freely uniting themselves to the Passion and death of Christ." 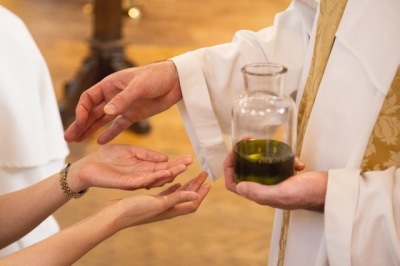 Please call the Parish Office at 407-695-3262 when family members are seriously ill or hospitalized and wish to receive the Sacrament of the Anointing of the Sick. Please Note: Privacy laws prohibit hospitals from releasing information to clergy about hospitalized church members without specific consent and request of a patient or their immediate family. and to taste and see your goodness. showered on me for so many years. For you are Lord, forever and ever.